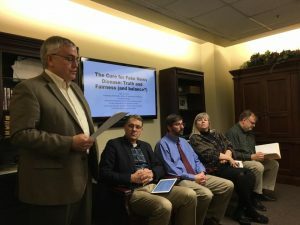 At a time of conflict, stress and challenge, journalists must not change their mission and their standards, the chair of the Society of Professional Journalists’ Ethics Committee told journalists at the University of Kentucky Wednesday evening. Even though journalists have “the most powerful person in the world attacking us,” they must not take the bait of an adviser to President Trump and become “the opposition party,” Seaman said. They must continue to do the work that democracy and society demand, and “be careful of the friends you make while you are under attack. Seaman made another point familiar to rural journalists: “Be part of the communities you serve,” spending time that doesn’t involve reporting. Seaman’s appearance was the latest in a series of “Challenges to Journalism” programs sponsored by the UK School of Journalism and Media, its Scripps Howard First Amendment Center and Institute for Rural Journalism and Community Issues, the UK Department of Communication and the campus SPJ chapter and Bluegrass SPJ chapter. The next one will feature Rich Boehne, CEO of E.W. Scripps Co., March 30. Al Cross is director of the Institute for Rural Journalism and Community Issues, based at the University of Kentucky, and an associate professor in the university’s School of Journalism and Telecommunications. He’s also co-adviser for UK’s chapter of SPJ.This post originally appeared on the The Rural Blog. . The somewhat odd lawsuit Western Kentucky University filed against its student newspaper challenges an attorney general’s ruling on an open records request. The WKU lawsuit shows the length universities will go to keep things secret, especially when the things involve sexual misconduct. Secrecy is nothing new at WKU. It just completed a hiring process for its new president, a process conducted entirely in secret. So the lawsuit WKU filed against the Herald comes as no surprise. Its oddity: WKU essentially sued itself. The Herald is editorially independent, but WKU Student Publications which oversees the Herald and a yearbook-turned magazine, received $350,000 in WKU’s 2016-2017 fiscal budget. The suit also names Herald staffer Nicole Areas and the Kentucky Kernel student newspaper and its staffer Matthew Smith. The Kernel first requested the records from WKU. The Herald request followed. The lawsuit states that the university has no complaint with the Herald, which sought records of university investigations into sexual misconduct under the federal Title IX statute. Its beef comes with the commonwealth’s attorney general who ruled WKU must give those records up, the lawsuit states. WKU cannot sue the commonwealth’s Attorney General’s Office, so it must go after the Herald. People a lot smarter than me can see the flaws in WKU’s position. First, if the university acknowledges the investigations are no longer ongoing — for whatever reason — then that shows the information gathered from them is no longer draft but complete even if WKU took no action. As to playing the privacy card, a handy trump card used more frequently by public entities, WKU is a “public” institution. And it should be noted that WKU has released personnel information about its employees, most notably a letter of termination for an employee which identified the employee and which contained negative and potentially harmful information about that employee. The issue of victims and their privacy also arises. The attorney general’s ruling allowed WKU to redact personally identifiable information from the records. WKU contends redactions will not ensure privacy. I think is important to note, particularly for students —legalese aside — that sexual misconduct on college campuses is a serious issue. The more the public knows about it, the better off we all will be. And the more the public understands the process used by universities when situations involving sexual misconduct occur, the better off we all will be. It is reckless to take a position that because the people investigated left WKU’s employment, the incidents essentially did not occur. And I think it’s important to note that people understand the sensitivity and the concern that comes with victims. But the other side of that coin is that there are public safety issues in play here, so it’s important to know where and how these incidents occur to prevent others from becoming victims. WKU states in the lawsuit that since 2013 it received 20 complaints alleging sexual misconduct under the federal Title IX statute. All were investigated and six were found to have caused violations of WKU policy. That indicates a problem with sexual misconduct at WKU — a “public” problem. Mac McKerral is a professor and Journalism Unit coordinator in the School of Journalism & Broadcasting at Western Kentucky University. He has been a member of the Society of Professional Journalists since 1989 and has served in numerous roles, including president of the national board. He currently is co-adviser to the WKU chapter of SPJ. The Election of 2016 is over. President-Elect Trump is a reality – one that few in the media anticipated. It was also a monumental year in Kentucky, with Republicans claiming the state’s House of Representatives and Senate for the first time in more than a century. What was the role of the national media in the election? Why did Kentucky’s legislature flip from Democrat to Republican? And what does the future hold for press rights and freedom of speech under President Trump? The event is free and open to the public. It is co-sponsored by SPJ, Louisville Pro Chapter and the University of Louisville SPJ chapter, the University of Louisville School of Arts and Sciences, Department of Communication and The Louisville Cardinal, which is the student-run newspaper at the University of Louisville. For more information about the SPJ Louisville Pro chapter, visit our web site, www.spjlouisville.org.